Anybody who knows me, knows I am an Asian food fanatic. I can be extremely snobbish when it comes to Asian food. There are times when I would get a jonesing for Orange Chicken (can't anymore though! Unless I get it unbreaded!) but we all know that is NOT real Asian food. It's Americanized. Well, in junior high I became best friends with a girl from Laos who had come to the United States as refugees and came via Thailand to the United States. She introduced me to the savory, mouth watering and fresh dishes of Laos and Thailand. Both cuisines are very similar but different. I adore Som Thom (Green papaya salad), sticky rice, hot sauce and beef jerky. I could eat until my tongue falls off and my belly is beyond full. On to my point. Really! I do have one! I ate Spicy Basil Chicken at a Thai restaurant in Scottsdale called Swadee. It was out of this world delicious! Holy cow. The flavors, the spice.. absolutely DIVINE. I have been making REAL Thai and Laos food since junior high and I KNOW I could make this with no problem. I found a recipe on Thaitable.com and ran with it! Once again, my camera still doesn't have batteries but that's ok. I found a picture on rasamalaysia.com that looks similar to my finished product (Please email me if you need me to remove the photo!). I SWEAR this week sometime I will, I repeat, I will buy batteries! LOL. Mince garlic and chili pepper together. Clean and pick gra-pow leaves from their stem. It may appear like a lot of leaves, but the leaves will shrink when cooked and this dish's flavor comes from the leaves. Fry the garlic and chili pepper in oil over high heat. 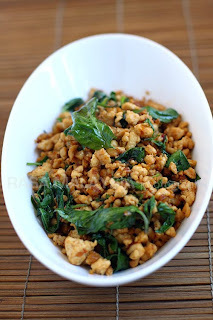 When garlic starts to turn brown, drop the ground chicken in. Stir constantly. The juice will start to come out. Keep stirring until all the juice is gone. It might take a couple of minutes. Add sugar and fish sauce. Then add Thai basil. Quickly turn it over a few times to mix the leaves with the meat and then remove from the fire and put the gai pad gra pow in the serving plate or dishes. Serve hot with rice. If you can find Holy Basil, go for it. We have a large Asian market here called Lee Lee's and I could only find Thai Sweet basil but the dish was ridiculously yummy and tasted, if I must say so myself, better than Swadee's. Sorry Swadee! I will toot my horn without any shame at all! I served this with Jasmine Rice and passed out from pure bliss! Not only did this taste BETTER, it cost much less. The dish at the restaurant was $10.95. The package of ground chicken was $3.00 (I only used half! ), the package of chiles were $1.34 (I only needed three out of like 70 that were in there! ), the Thai Basil was only $1.44. I already had the fish sauce, sugar, garlic and Jasmine Rice. This is another recipe that sounds fabulous. I am going to print this one out. Now, I have two dishes to make next week, or later this week. Thanks. One thing though, the fish sauce sounds kind of yucky (i am not big into fish). Is that sauce necessary, do you think a different sauce could work? If it is necessary, I will go for it.